My Firsts is our email interview series where we ask musicians to tell us about their first life experiences, be it early childhood ones (first word, first concert, etc.) or their first tastes of being a musician (first band, first tour, etc.). For this My Firsts we talk to Elizabeth Stokes of The Beths. 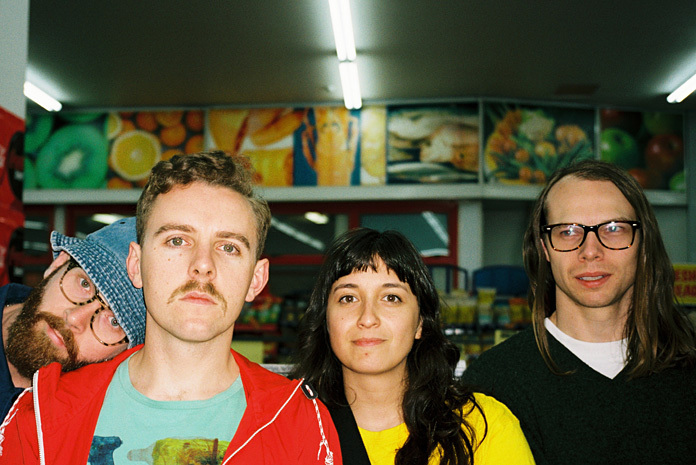 The Beths are a new four-piece from New Zealand who released their debut album, the amusingly titled Future Me Hates Me, last month via Carpark. All four members of the band (Stokes, Jonathan Pearce, Benjamin Sinclair, and Ivan Luketina-Johnston) studied jazz at university, but the band has more of a scrappy indie rock vibe. Previously "Happy Unhappy" was an honorable mention in our Songs of the Week list and we posted a lyric video for another song from the album, "Great No One" (which was also an honorable mention on our Songs of the Week list). Stokes had been a fixture on the Auckland music scene and prior to The Beths she played in a folk band. "Fronting this kind of band was a new experience for me," said Stokes in a press release announcing Future Me Hates Me. "I never thought I had the right voice for it." Stokes is the primary songwriter in The Beths and Future Me Hates Me is a strong showcase for her sad and honest lyrics, which are wrapped in upbeat rock tunes. Stokes says it has something to do with growing up in her home country. "That's another New Zealand thing," Stokes jokes in the press release. "We're putting our hearts on our sleeves—and then apologizing for it." Read on as the 27-year-old Stokes talks about her first pet, the first boy she kissed, her time on Myspace, the first time she got drunk, and her earliest band. Henry the Hound-dog was a yellow lab whom my parents told me was born on the same day as me. I was happy to share a birthday with my best dog friend and am not proud of how old I was when I first questioned this claim's validity. Henry was a sweetheart who would eat anything. He passed away when we were 14. Oh no. Let's call him Kane. Kane was cool and in a band and went to another school, and we were 12 or 13. He asked me out and we caught the ferry into town to see an all ages show. I was chronically shy and couldn't really look him in the eyes. While the band was playing we went in for a kiss and it was nice for a second and then his WHOLE TONGUE was in my mouth I swear. It was awful and I was definitely not ready. After that night I didn't see him in person for two weeks and he broke up with me on MSN messenger because we were "growing apart." I was relieved. The first album I bought was Love and Disrespect by Elemeno P, a New Zealand band who wrote guitar pop bangers. I bought it in 2003 from Soundz, the local record chain store who went out of business when people stopped spending $35 on CDs. I was 13 and it was an iconic album. Last year an iconic Auckland venue, The King's Arms, closed down and Elemeno P played the last Saturday night there, and The Beths got to open. I tried to play it cool but ended up drunk, three from the front with tears streaming down my face. Classic. My older sister took me to Auckland Edgefest 2004 when I was 13, a festival put on by a "young, hip" commercial radio station The Edge. I was completely squished, covered in other people's sweat, and just having a great time watching Yellowcard. I just looked up the full line-up, and two things strike me. One is how many New Zealand artists were being played by a commercial radio station; NZ music is pretty rare on commercial radio these days, but the local university stations keep it alive and kicking <3. The second is how few women were on the line up, but I suppose that's no surprise. Don't tell my parents. I was 13 and at my best friend's house. She was much more wild than me and I am grateful for her influence. Her parents owned a couple of liquor stores in South Auckland, and one night after school she decided we were going to drink this six pack of banana flavored twisty shots. I'm not sure what the technical term is for these, but they tasted terrible. I vaguely remember giddily staggering down to the beach, but I more vividly remember how much more terrible the shots tasted coming back up. I am a child of the MySpace era, and I believe the ghost of my profile is still floating around the graveyard. I had a pseudonym and several high-angled shots of my dyed-black fringe. My profile also included an auto-play song that I'm fairly sure was "Loosen Your Tie" by The Remus Lupins, my favorite wizard rock band at the time. We had a hand-me-down piano in the house when I was very young and my sisters and I were given lessons, which was very kind and generous of my parents. We all quit after a couple of years of course. I distinctly remember being told off for "playing by ear," which confuses me as an adult who also does some music teaching, using your ears is surely something to be encouraged. Anyway, to this day I can still rock "When the Saints Go Marching In," "Heart and Soul," and nothing else. Piano is still the most difficult instrument to me. The first band I was in was a folk band called Teacups. My best friend Chelsea and I used to busk at the local shopping center when I was 15, mostly Jenny Lewis covers, and after a while she decided we were a band. I resisted because I knew that only super talented people got to be in bands, like the boys at our school, but then she gave us a name and made us a Myspace page so it was official and there was nothing I could do about it. I owe Chelsea everything for gently but firmly pushing aside my imposter syndrome and opening up writing music as an avenue. She is now making music as Chelsea Jade and is a monster songwriter <3. Chelsea and I recorded our demos onto Audacity using a headset mic plugged straight into the computer. We would hold the headset either up to a mouth or to a guitar. I am sorry to say that this is not too dissimilar to the set up I currently use to record demos.